Free Willy 2: The Adventure Home is a 1995 American family film, directed by Dwight Little, and distributed by Warner Bros. Pictures under their Warner Bros. Family Entertainment label. It is a sequel to the 1993 film Free Willy, also starring Jason James Richter and August Schellenberg. Free Willy 3: The Rescue, was subsequently released in 1997, making a trilogy. A fourth nonconsecutive film, Free Willy: Escape from Pirate's Cove was released on DVD in Spring 2010. Keiko the Orca does not actually appear in this film unlike the original film. Willy is played by a robotic double while the Free Willy Keiko Foundation devised a plan to bring him to the Oregon Coast Aquarium where he would be rehabilitated for poor health. 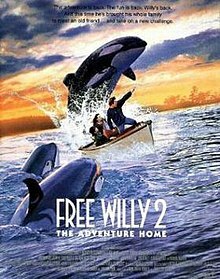 As of March 20, 2019, Free Willy 2: The Adventure Home is one of the few Regency Enterprises productions not to be owned by Disney through 20th Century Fox, due to the rights still being held by Warner Bros. It's been two years since Jesse saved and freed his orca friend, Willy. Jesse, now a teenager, has since been adopted by his foster parents, Glen and Annie Greenwood. Jesse and his adoptive parents are preparing to go on a family camping trip to the Pacific Northwest. Glen has been trying to teach Jesse to drive their motorboat, but Jesse is more interested in girls. However, before they leave town, Dwight, Jesse's former social worker, shows up to inform them that they have found Jesse's biological mother, who abandoned him 8 years ago. Jesse's mother has died and left behind another son, Jesse's half-brother named Elvis (Francis Capra) Elvis is morose, overly talkative and mischievous, and he is also prone to telling lies and easily gets on Jesse's nerves. He is invited on their trip to San Juan Island so that he and Jesse might get to know each other. At the environmental institute, Jesse reunites with his old Native American friend, Randolph Johnson (August Schellenberg) whom Jesse met at the aquatic park when he met Willy. Jesse quickly becomes smitten with Randolph's attractive and kindly goddaughter, Nadine (Mary Kate Schellhardt) Jesse also tracks down and reunites with Willy. Jesse cautiously begins to show his interest in Nadine, and as the awkward teenagers grow closer, Jesse helps Nadine befriend Willy and his orca siblings, Luna and Little Spot. Elvis spies on the two, but at the same time, forms a bond with Willy's brother Little Spot. As they continue to enjoy their camping trip, an oil tanker runs aground and spills oil into the ocean due to an engine failure, trapping the three young killer whales in a small cove. When word gets out that the orcas are trapped and Luna is dying from the oil in her lungs, John Milner, the CEO of the oil company (Jon Tenney) arrives and announces a plan to move the orcas into captivity where they can recover from their injuries. His real plan, however, is to sell the orcas to marine mammal parks. Elvis, who runs away, overhears the real plan and rushes back to warn everybody. With Luna's condition worsening, Randolph and Jesse eventually use an old Indian remedy that they administer to Luna, who recovers. Shortly afterwards, with the oil spill reaching dangerous proximity to the cove, the oil company and rescue workers boom it off despite Jesse, Randolph and Nadine's objections and begin extracting the whales. As the extraction of Little Spot commences, Elvis returns in time to warn Jesse and the brothers expose Milner's plot. With the help of a distraction by Jesse and Elvis, Willy manages to rescue his little brother. With time running out before the oil reaches the cove, Jesse, Elvis and Nadine steal Glen's boat to lead the whales to safety. On Jesse's signal, Willy is able to break the boom and leads his siblings out of the cove. However, an explosion on the tanker results in the crude oil in the water catching fire. Despite the danger, the three whales are able swim under the flaming oil to safety. Having followed the whales to ensure they got safely past the oil, Jesse, Nadine and Elvis fall into danger when they take their boat into another cove to avoid the flaming oil, hitting a rock and beginning to sink while the flames seal off the cove. At the same time, Glen, Annie and Randolph search for the three in Randolph's boat with Randolph sending a distress signal that summons the Coastal Marine Patrol to the trio's aid. A search and rescue helicopter is able to extract Elvis and Nadine safely, but Jesse slips out of the harness and falls back into the ocean. With smoke choking the helicopter's engine, it is forced to leave Jesse behind. Jesse nearly drowns but is rescued by Willy who returns for his friend. Willy is able to carry Jesse safely under the fire to Randolph's nearby boat. Jesse, after taking a moment to say goodbye, sends Willy off back to his family. Shortly after, the Coastal Marine Patrol brings Nadine and Elvis to Randolph's boat. Elvis gives Jesse an old picture of him and their mother, and explains that he once ripped it up out of anger, but taped it back together for him. Elvis tells Jesse that their mother always talked about him and that she felt bad about abandoning him. Jesse thanks him for the picture and hugs him, finally able to put his past at rest. Glen and Annie decide to adopt Elvis so the brothers can stay together. Sometime later, Willy and the other orcas are shown swimming happily in the ocean near the coast of the Pacific Northwest. Free Willy 2: The Adventure Home received mostly mixed reviews, and currently holds a score of 33% on Rotten Tomatoes, based on 15 reviews. Michael Jackson continued his affiliation with the Free Willy franchise, producing and performing the song "Childhood" for this movie. The Pretenders performed "Forever Young", heard in the end credits when the orcas finally are released in the ocean. On early UK home video promotions, the movie was titled simply "Willy 2: The Adventure Home", presumably because the film's premise, unlike its predecessor, does not involve Willy being freed. ^ "Free Willy 2: The Adventure Home". Box Office Mojo. Retrieved 22 November 2011. ^ Rainer, Peter (1995-07-19). "MOVIE REVIEW `Willy' Returns for More Family-Bonding". The Los Angeles Times. Retrieved 2010-11-27. ^ "Free Willy 2: The Adventure Home". Chicago Sun Times. Retrieved 2010-11-27. ^ "Free Willy 2: The Adventure Home". Entertainment Weekly. 1995-08-04. Retrieved 2010-11-27. ^ Klady, Leonard (1995-07-16). "Free Willy 2: The Adventure Home". Variety. Retrieved 2010-11-27.